Official Responses: 1), a company which – together with its associated companies – employs more than 400 people in Manchester and beyond, has agreed a deal with Manchester City Council to acquire a 120,000 sq. ft. plot of land opposite UKFast's campus headquarters in Birley Fields, Hulme. The planned acquisition of the plot of land would be key to the continued growth and acceleration of UKFast and its associated companies. The current Birley Fields Campus incorporates two identical 40,000 sq. ft. buildings, 1 and 3 Archway. Official Responses: 1) Report has revealed that the first 10 weeks of 2019 has shown more than 5.5m malicious events across UKFast's hosting platform, with 1.52m full attack attempts blocked in total, from a sample size of 181.5m total events analyzed. The first Threat Monitoring Report to be released by UK hosting provider UKFast is providing us with data and insight from UKFast's Threat Monitoring service, which continuously analyzes data to distinguish between potential security breaches and normal activity. Official Responses: 1), a large cloud hosting firm from the UK, has announced the launch of its Developer Center – a new platform that would empower developers to integrate their own systems and software with UKFast's products and services. This move comes following the delivery in the last 18 months of application programming interfaces (APIs) across key products within the UKFast product range. The APIs delivered by UKFast would open up new options for resellers and systems integrators while enabling greater flexibility for developers requiring hosting and security solutions. Official Responses: 1), a fast-growing hosting provider from the UK with 350 employees across its Manchester campus, London sales office and data centers, has announced a 30% stake acquisition UKFast by Inflexion Private Equity. After expectations about the company to be worth upwards of £350M last summer, the deal now sees the hosting provider from Manchester valued at £405 million (based on £25 million EBITDA). 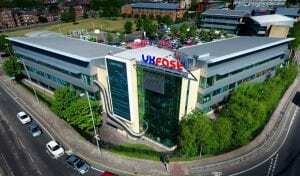 UKFast has five fully owned data centers, all ISO 27001 certified, PCI-compliant and secured to UK government IL4 standards. The company has a customer base of 5,500 UK SME clients and 200 mid-sized companies. Official Responses: 1), is designed to tackle the more intensive needs of designers, creatives, and architects. Official Responses: 1), a fast-growing hosting provider from the UK headquartered in Manchester, has engaged a team from global investment bank, GCA Altium, headed by their CEO, Phil Adams, to review strategic options including a potential float.